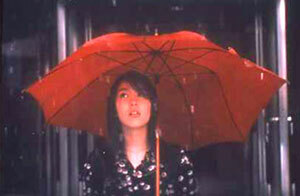 The Skinny: Charming, simple, and to the point, Shunji Iwai returns to basics with this short docudrama/romance. It may not be as astonishing as his previous works, but at 64 minutes, it's much better than it could've been. Unlike much of the world, the New Year begins in April in Japan. April marks the season of the Sakura bloom, the beginning of a new fiscal year for the government, and also the beginning of a new school year for Japanese schools, where hordes of new students invade college campuses around the country. One of those students is Uzuki Nireno (Takako Matsu). Leaving her family in the isolated northern prefecture of Hokkaido, Uzuki is looking for a new beginning all the way out in Tokyo as a freshman in Musashino University. Originally conceived as a short film, April Story is, unlike Love Letter and Swallowtail, remarkably simple. In an almost documentary fashion, Iwai simply follows Uzuki around as she deals with a new school and a new environment until her reason for choosing Tokyo and Musashino is finally revealed. Iwai indulges in details rather than narrative, an approach that Iwai has attempted a little too much in his previous films, and also might alienate viewers who prefer their films with plots and character development. But unlike his previous films, where Iwai's self-indulgent use of details detracted from the plot, April Story benefits from immense detail because of its nature as a character study. In addition to his attention to details, Iwai also sticks close to his personal style, opting for a dreamy visual look that matches the fairy tale tone of his film. From the sights of falling Sakura petals along an empty street to Uzuki running in the rain under a red umbrella, suburban Tokyo has never looked more beautiful. But the real star of the film is Takako Matsu. As the focus of the film, Matsu, who was still at college age at the time, brings a charming innocence to Uzuki. Despite her initial awkwardness and her character's ulterior motives, her character is easy to relate to because she is so awkward. Uzuki may be just another young "fish out of water" in big, bad Tokyo, but it's Matsu's performance that keeps Uzuki a compelling enough character to warrant the focus. Notes:  Takako Matsu attended and graduated from Asia University, located just two train stations away from the real-life Musashino University.